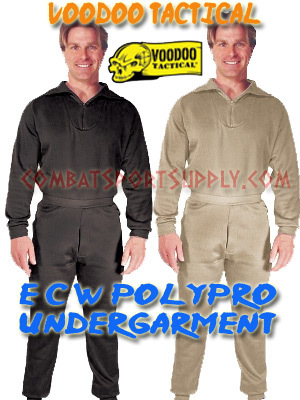 Government Issue Extreme Cold Weather Clothing System (ECWCS) Polypropylene underwear is provided by the military to its personnel in cold weather situations. Wicks the moisture away from the body to the outer garments, where the wearer will not be affected and will stay warm and dry. Military weight polypropylene, combined with its fleeced lining, offers high levels of insulation against the outside cold in addition to providing an even and steady comfort level. Thick and soft - the warmest underwear you can own! Top has a zipper neck design (adjusts from open neck to full turtleneck), long sleeves and knit cuffs. Brand New Never Issued! Tops run true to size.